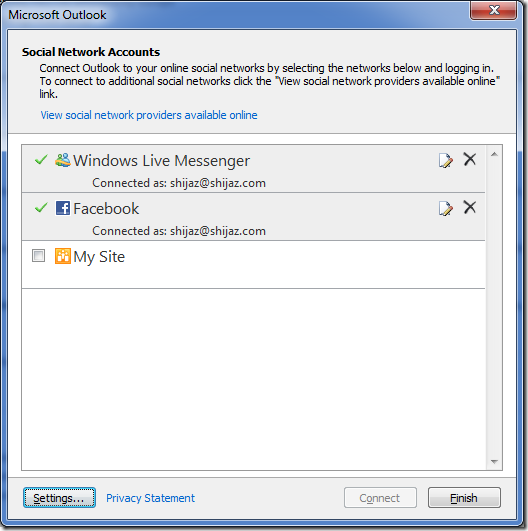 Outlook 2010 now features Social Networking Connector Provides for Windows Live Messenger, LinkedIn, MySpace and Facebook. This brings in a whole new dimension in Outlook beyond plain old email. The same goes for updates from LinkedIn, Windows Live Messenger and MySpace. 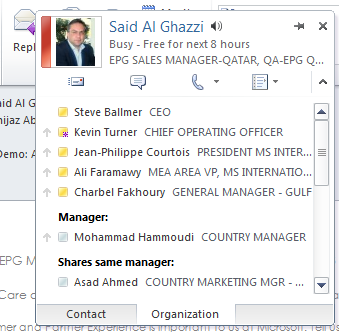 You can also add people you email with to your Facebook right from Outlook by clicking on the Add button. 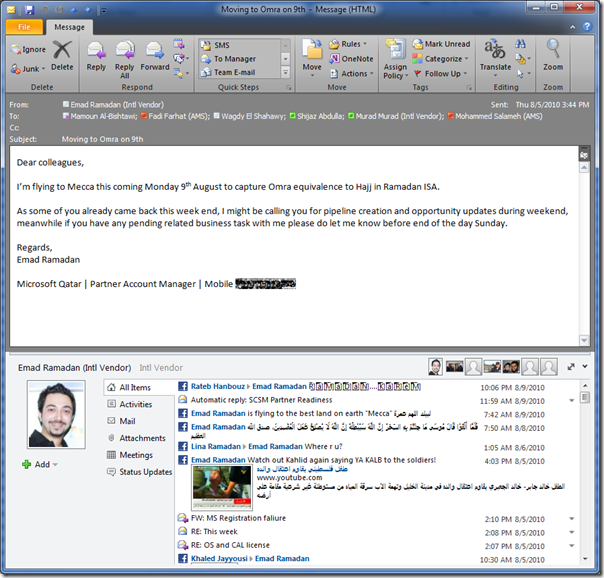 To enable the connectors, simply download and install them and restart Outlook. 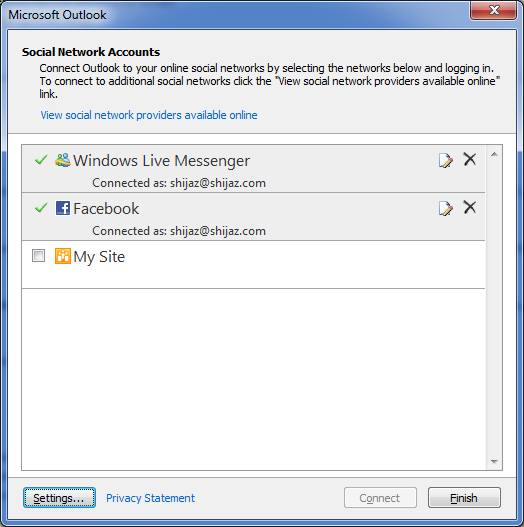 You will be prompted to enter your credentials to the social networking sites. If you are not prompted, go to View > People Pane > Account Settings. Watch the Outlook Social Connector Partners page to stay updated about other social networks that will have connectors for Outlook coming soon. I’ve been using the Office 2010 Technical Preview and the Beta for quite some time now. 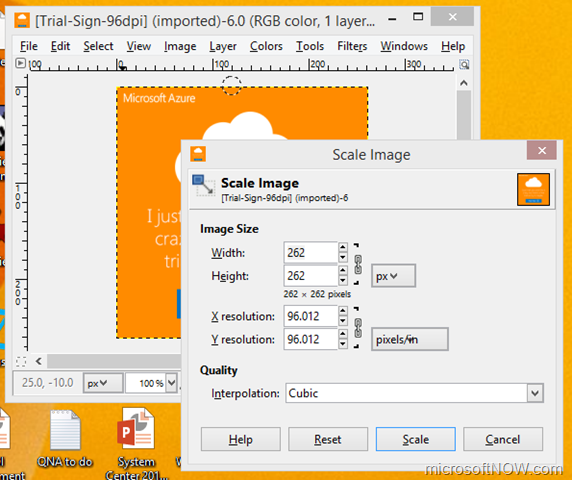 In this post, I share 10 new features in Office 2010 that I like. 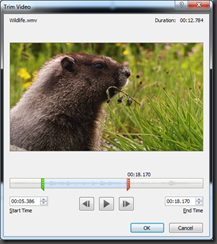 You can now easily trim a video (i.e. 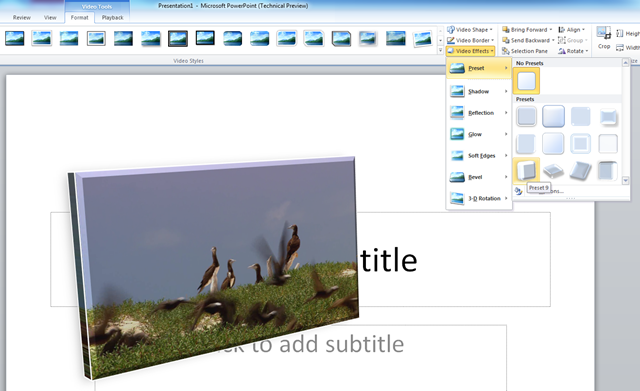 play only a section of a video) or transform it in Powerpoint, without the need for any third-party tools. 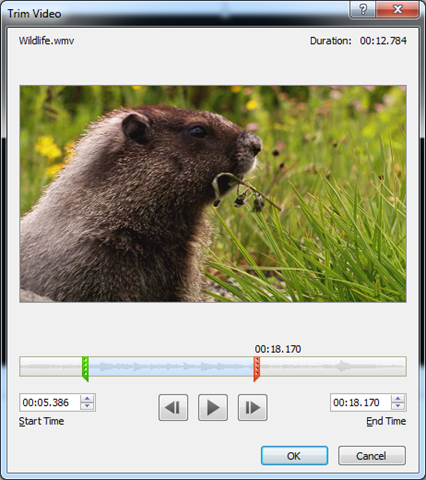 Right click on video, choose Trim Video. Choose Start and End points for the video. 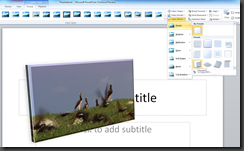 Transform the video using any 3D/bevel option. 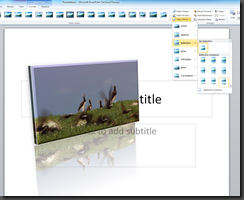 You can also add a reflection on your video! Run the presentation, the video plays as trimmed and automatically transformed/rendered as you selected, and the reflection also changes depending on the motion in the video! 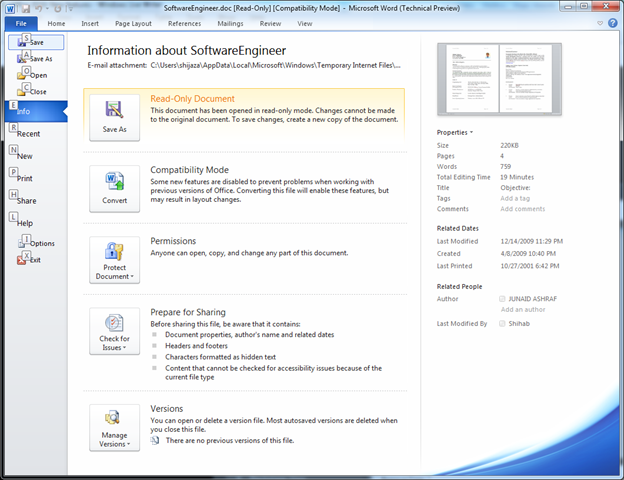 You can now insert a screenshot of any application that is currently running on your PC without having to hit PRINT SCREEN. Can even make your clipart and photographs look like oil paintings, pastels, pencil sketches and more. For documents that originated from the Internet. 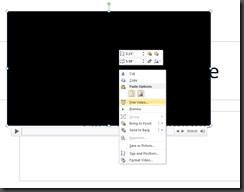 You can minimize the Office Ribbon when you need some extra space by clicking the show/hide button marked in red. This has replaced the Office menu. 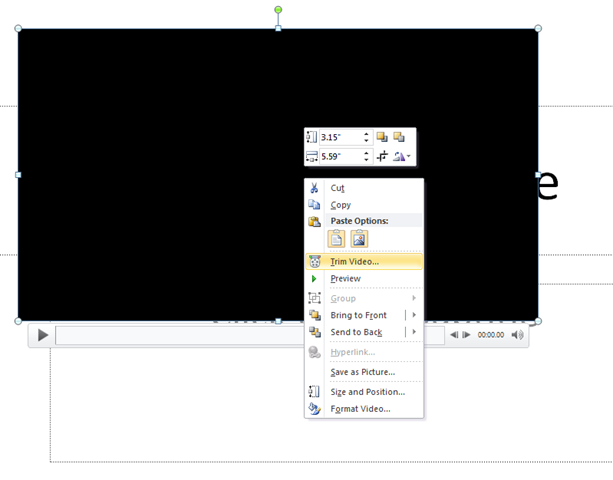 When you click the File tab, you are taken to a “Backstage”, where you can view and control properties for the document. 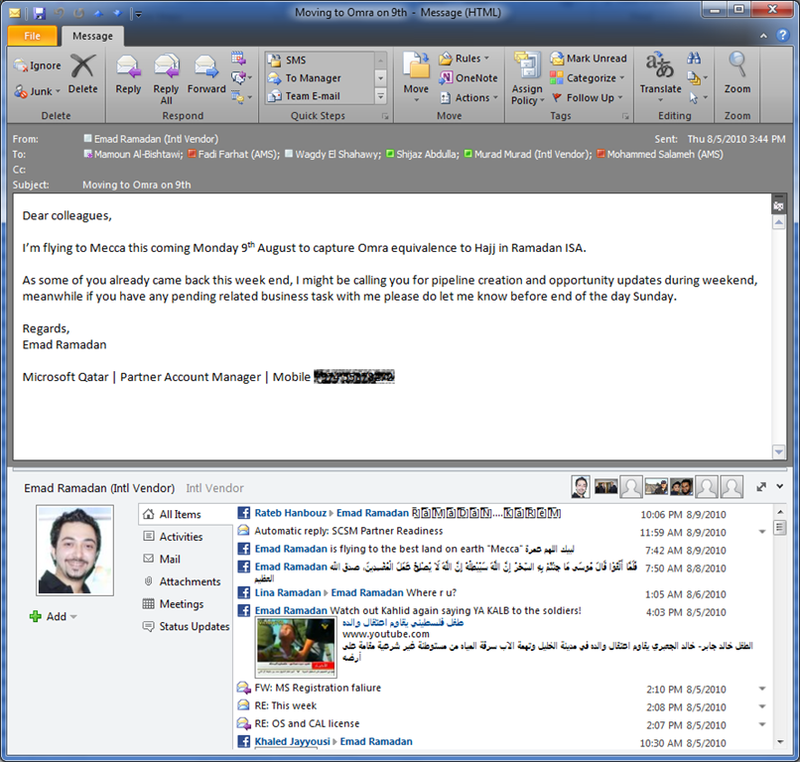 Leverages functionality from SharePoint and Exchange Server and displays photographs and social networking information for all individuals involved in an email conversation. 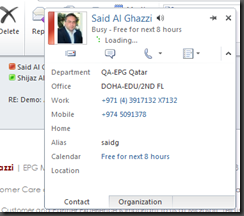 Lets you quickly see ways in which you can interact with a user (instant messaging, phone numbers, email), his picture, profile, organizational information, etc. Very handy – and fully integrates with Office Communicator and SharePoint. 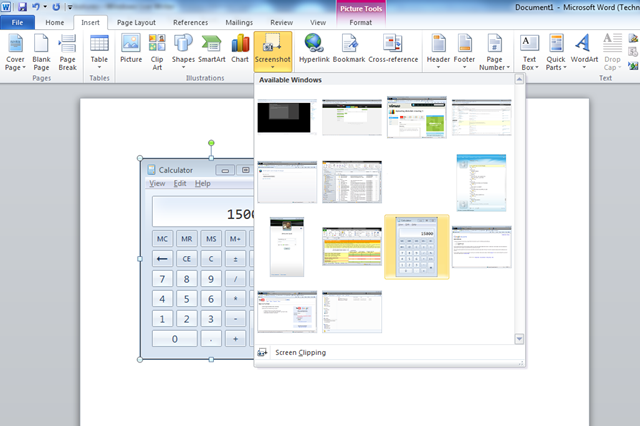 There are lots of other new features in Office 2010, this is just a preview of 10 features that I like. To get updates from my blog, subscribe with RSS or subscribe by email or get Windows Live Alerts. One common query that administrators have is the matter regarding opening two Outlook profiles simultaneously. 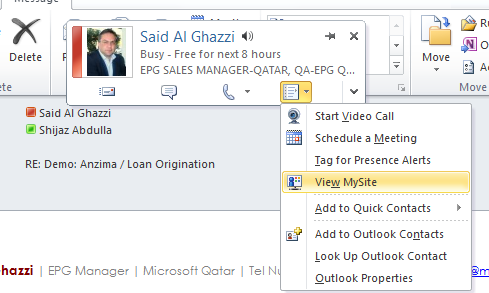 As we all know, only one Outlook instance (profile) can be open on a PC at any given time. You can of course, open more than one Exchange mailbox inside the same Outlook instance – however this leads to (user) complications of which ‘from’ address to use when responding to email. 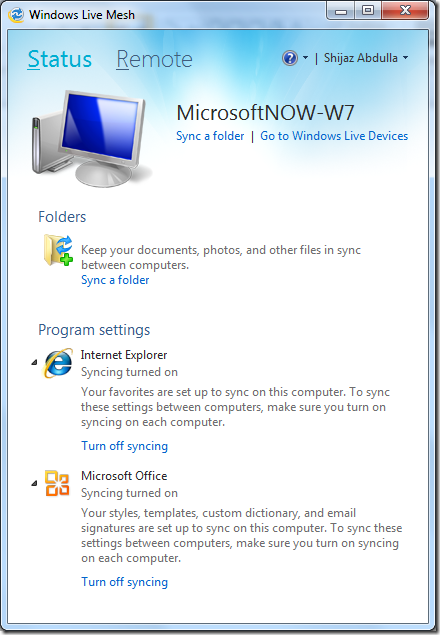 Jason Geffner has come up with the smart little utility that helps you run two instances of Outlook at the same time. It’s called ExtraOutlook. Try it out. 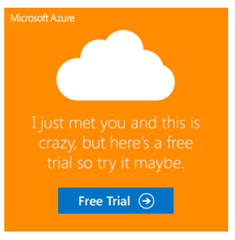 And here’s a little disclaimer: This tool is neither endorsed nor supported by Microsoft. As with all other information you find on this blog, use it at your own risk! The AutoComplete cache fetches commonly used email addresses when you type the first few characters in the To, CC or BCC box when you compose a message in Outlook. In this post I will explain how you can remove entries from the AutoComplete cache. 1. 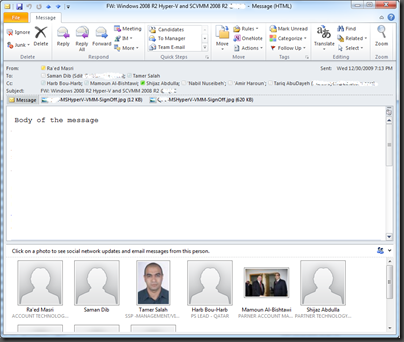 Compose a new message and start entering the first few letters of the contact you want to remove from the cache. 2. Once Outlook suggests the contact, hit the DEL key on your keyboard. 2. Start –> Run. 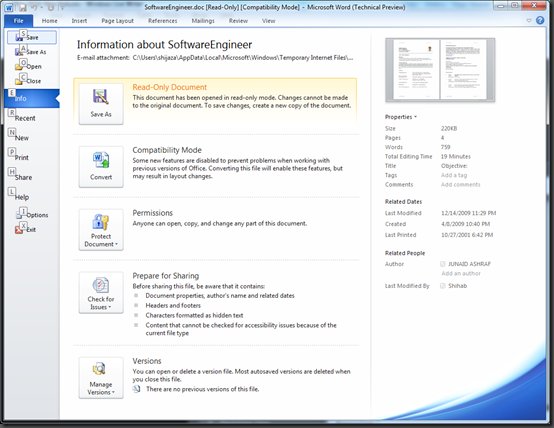 Type “%userprofile%application datamicrosoftoutlook” (including the quotes) and click OK.
3. 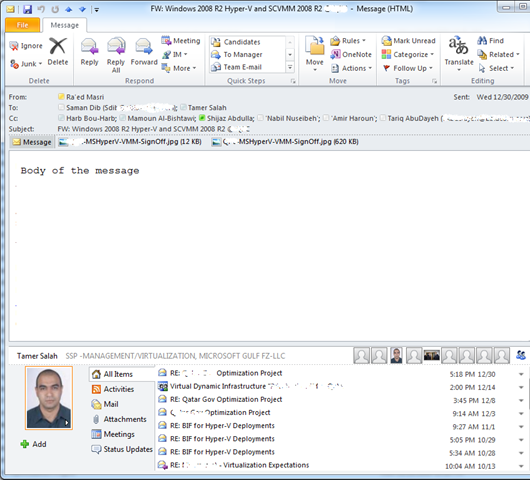 You will find an NK2 file named after each Outlook profile. 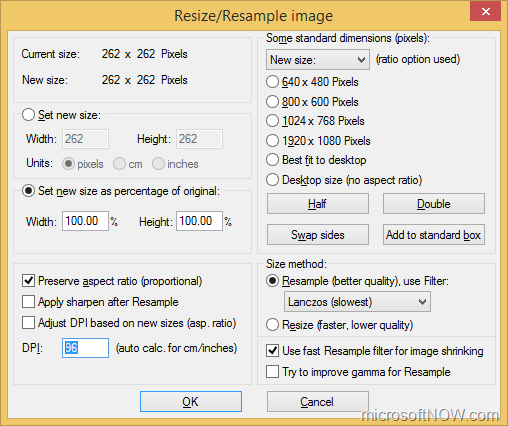 Rename the NK2 file. (The NK2 file is your autocomplete cache file aka nickname cache file). If you had to change the legacyExchangeDN for your users as part of a migration or other manual process, or even an error in your automated user provisioning software, there are certain things that you need to be aware of. The first thing you need to do after changing the legacyExchangeDN is to initiate an Offline Address Book rebuild. The way out of this problem is to instruct the sender to first download the Address Book by doing a full Send/Receive. Then ask the sender to manually select the affected recipient from the Address book instead of using the cached Autocomplete. 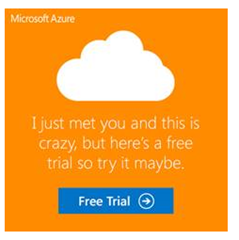 This is because, in an Exchange organization, Outlook client autocomplete caches do not save the SMTP email address. Instead, it saves the X.500 address using the legacyExchangeDN attribute from Active Directory. And that’s exactly what you have changed! There is another workaround to prevent the NDRs. This would be to enter the old value of the legacyExchangeDN attribute as an X.500 address for the user account. 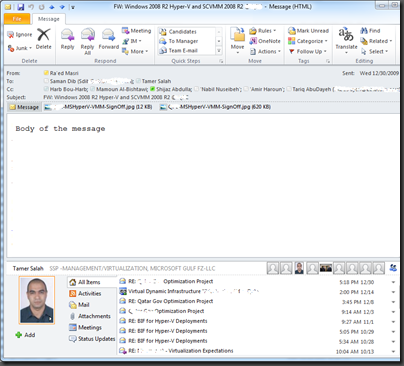 This is done by opening the user object’s Email Address properties –> Add a Custom Address –> Enter the old value of legacyExchangeDN as the address and the address type as "X500" without the quotes. 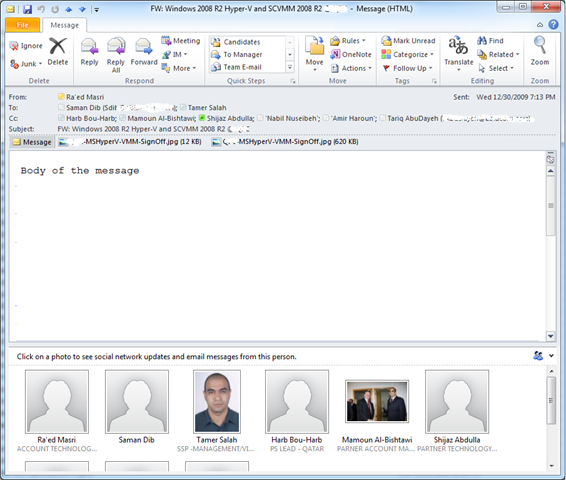 The drawback of this method is that you are populating the user’s email address field with garbage, which you don’t need after a while but can’t remove because you are unsure if traces of the old entries in Outlook caches are gone!